Didier Deschamps was surprised by the criticism levelled at him by Laurent Koscielny during his international retirement announcement but accepts he could have made more effort with the centre-back during his injury lay-off. 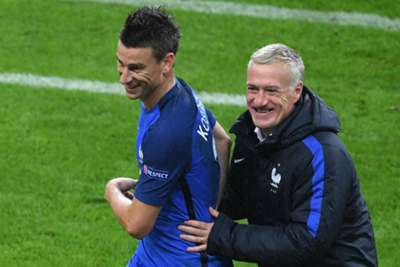 Koscielny called time on his France career on Sunday, citing disappointment with coach Deschamps due to a lack of communication while he was on the sidelines. "For my part, I called him after his injury, even discussed his choice of surgeon with him, I invited him to come during the [World Cup] preparation if he wished. I made sure that he could come to the final in the presidential plane. "I got back to him in September for his birthday, I had a brief chat with him yesterday on the phone. It is true that I had not [spoken with him] in the last 15 days or a month or so. I could have done more. "It will not change what I think of Lolo [Koscielny] as a player and as a man. He is someone who has good values." France are back in competitive action on Tuesday when they face Germany in the Nations League and Deschamps is toying with the idea of playing Kylian Mbappe as a central striker. "Kylian performs well in different positions," Deschamps said. "He is an option with a different profile to [Olivier] Giroud. "I left with this idea on Thursday [after the 2-2 draw with Iceland]. He is able to be effective out wide as well. When he is in the middle, he also moves a lot to the flanks.